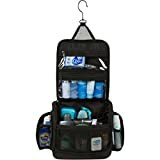 ALL-IN-ONE HANGING TOILETRY MAKEUP BAG AND ORGANIZER: Numerous pouches, zippers and removable TSA clear compliant pocket to store all your travel essentials and cosmetics / make-up. No mess, spills or digging for toiletries. ORGANIZE TRAVEL TOILETRIES: Compact yet large enough wash bag to carry all travel essentials upright. Side pockets with extra elastic loops and mesh bags for makeup, toothbrush and small travel items. Sturdy bottom assures your travel cosmetic bag remains upright. EXTRA BONUSES: Removable clear travel TSA compliant zipper bag for easy airport security checks, versatile water-resistant drawstring shoe bag / laundry bag or wet item storage is an extra bonus. The TravelGenixx hanging toiletry bag folds FLAT so takes up very little storage space when not in use. And drawstring shoe bag keeps it dust-free. TRAVELGENIXX Money-Back Guarantee (always). WORLD CLASS BEST CUSTOMER SERVICE (we promise). And be sure to see our SPECIAL OFFERS and PROMOTIONS by scrolling down the page. WHAT MAKES THIS TRAVEL HANGING TOILETRY BAG BETTER THAN ANY OTHER KIT? Simply put, we have thought of everything…design, hook, space, material and convenience. Why put up with spills, messes and digging for toiletries when you can have the best toiletry organizer in a compact hanging wash bag? There are mesh pockets, bags and double zippers for everything from storing large shampoo bottles right down to small earbuds or tweezers that need their own compartment. Find what you are looking for in a glance. A separate and DETACHABLE TSA Compliant clear zipper bag for small travel essentials or makeup in your hand luggage makes airport security super easy. Once at your destination, simply attach to Velcro strip and flip over elastic loops to securely replace as part of your hanging toiletry kit. Designed to be large and strong enough to hold all your travel toiletries in one wash bag. Sturdy enough to stand on bath corner without collapsing or hung from bathroom shower door at gym. Made from durable, water-resistant 420D nylon this toiletry kit can withstand years of travel. And when not in use, simply flatten and place in drawstring show bag for easy storage. Not ALL HOOKS are the same. Most other travel hanging toiletry bags have small hooks that don’t swivel. Our TravelGenixx toiletry bag has a 360 degree sturdy metal swivel hook that can even hang over a door when no hook is available. We are an international brand committed to our loyal customers. You will love our travel toiletry bag or your money back. It is excellent value for the money spent. We always offer a 100% Money Back Satisfaction Guarantee. No questions asked. Thank you for your purchase. Have a safe trip and create many happy memories. This entry was posted in Luggage and tagged Accessories, Bathroom, Hanging, Perfect, Toiletries, travel, Women by Perfect Vacation. Bookmark the permalink.